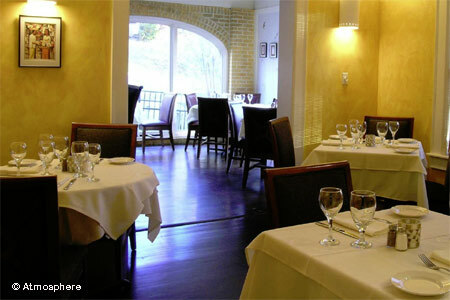 Rely on Atmosphere for straightforward, traditional French fare in a comfortable, romantic setting. Lunch & Dinner Tues.-Sun., Brunch Sat.-Sun. : This long-established French bistro, with its warm atmosphere, nice lighting and well-spaced tables, offers a classic vichyssoise (although it's not always on the menu), or perhaps begin with the garlic snails or an assiette de charcuterie. Entrées may include moules marinières frites, coquilles St-Jacques with truffle Parmesan cream, and confit de canard. The menu allows guests to order scaled-down sizes in a number of instances, so if you go for the confit, you can choose a one- or two-leg portion. Profiteroles are a must for dessert, although we also like cheese. The short wine list is not especially adventuresome, but there are plenty of options by the glass and it’s easy to find something that goes with the food. The glassware is pretty banal, so consider bringing your own. On weekends, the brunch crowd descends en masse. If you prefer dining outside, there’s a streetside patio, although the traffic is pretty close to the tables.